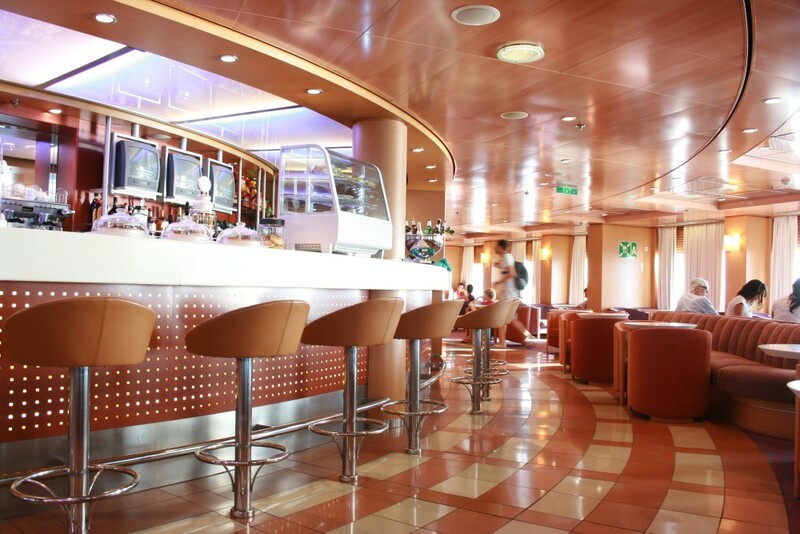 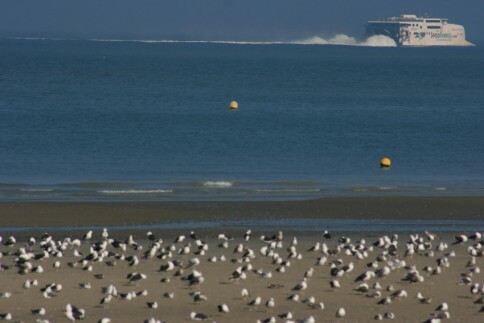 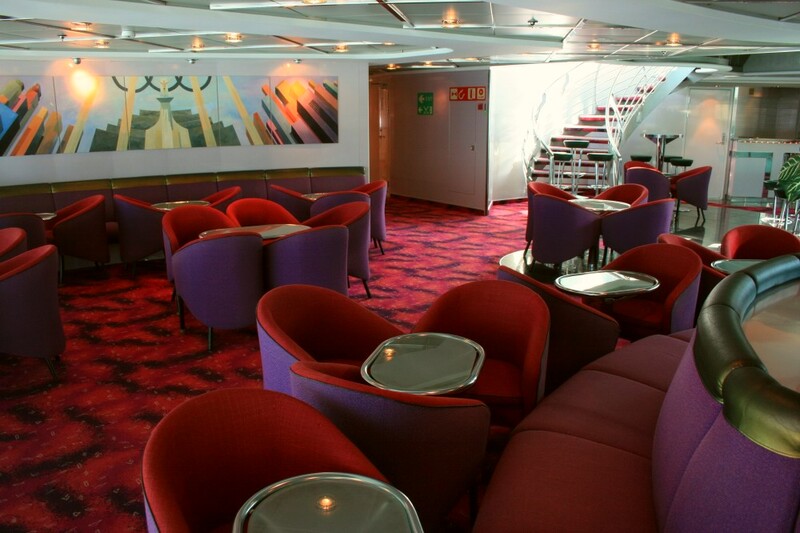 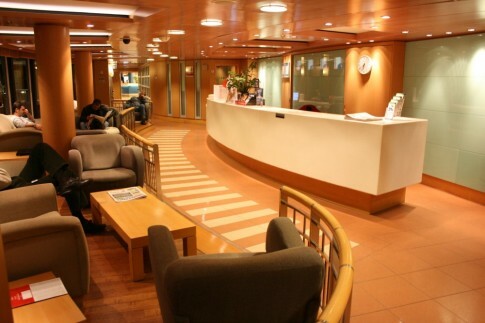 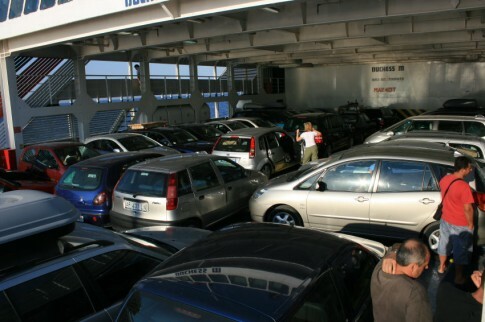 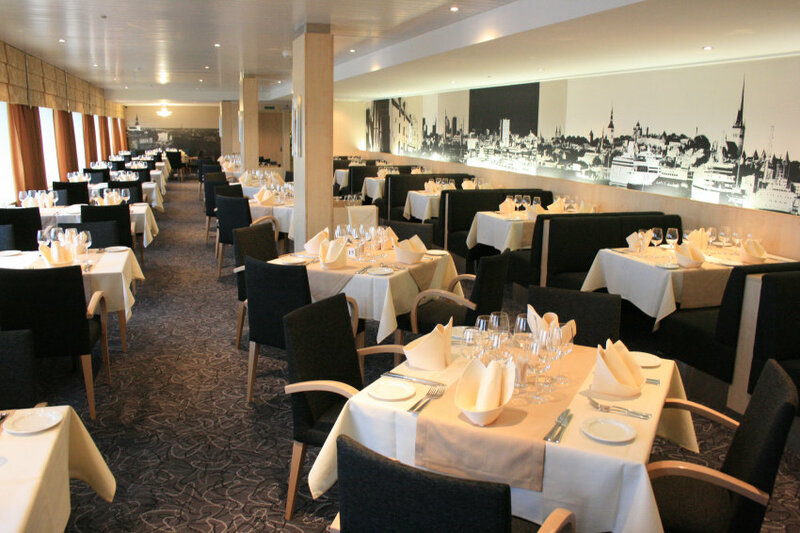 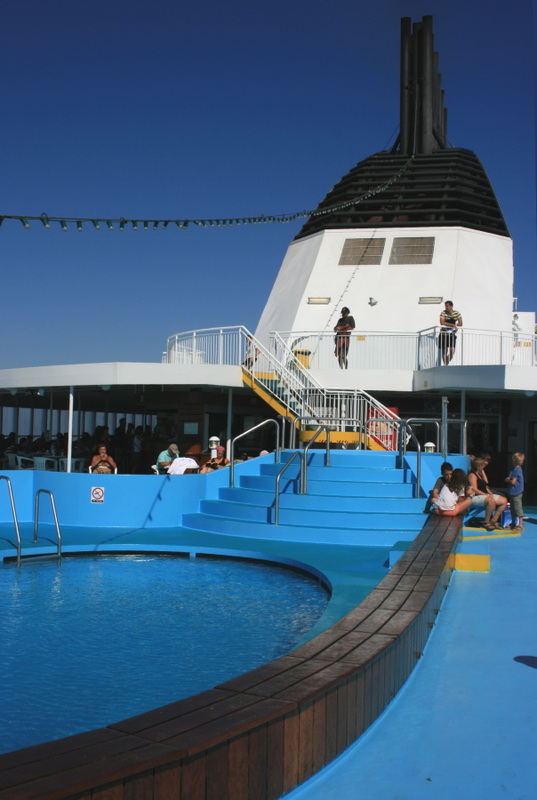 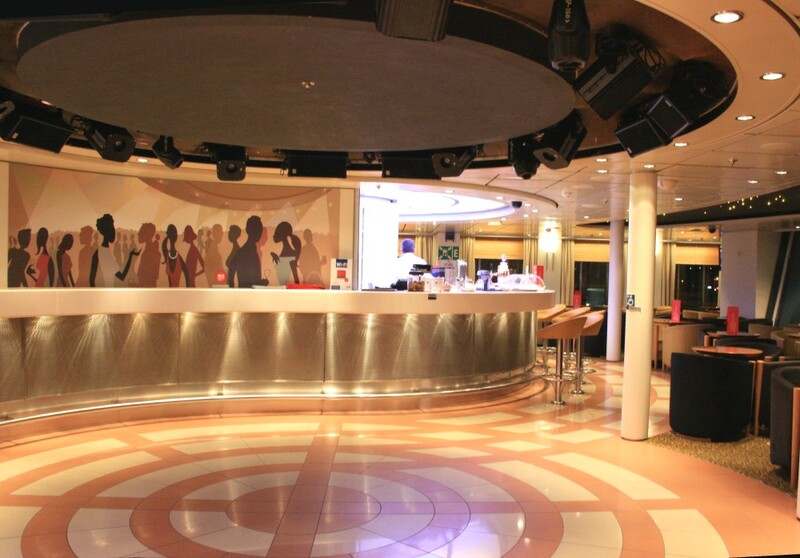 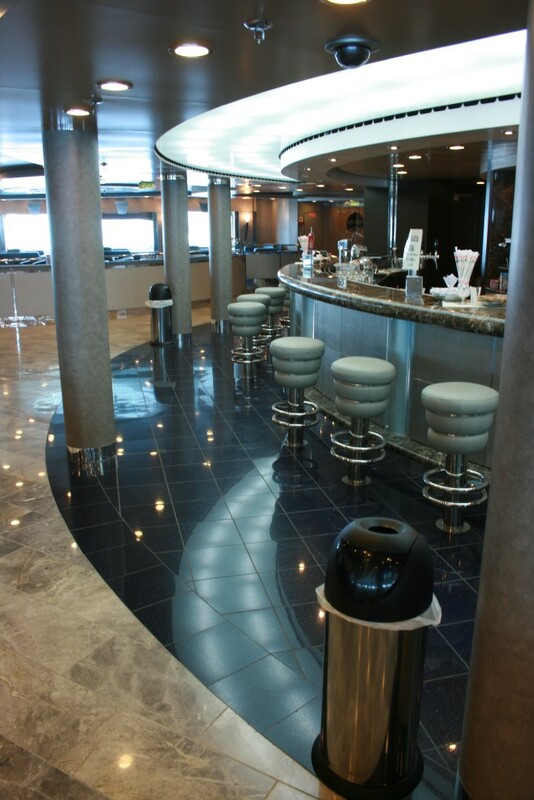 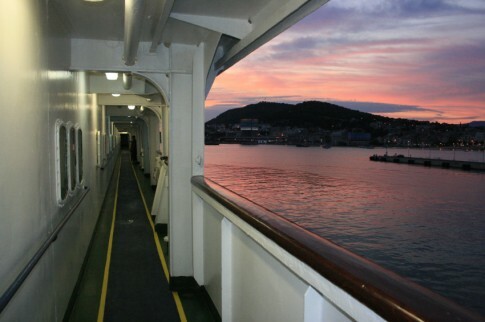 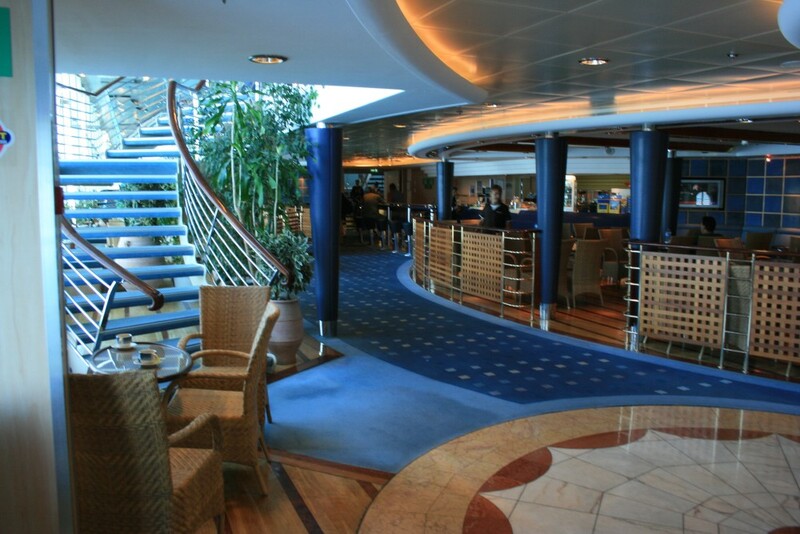 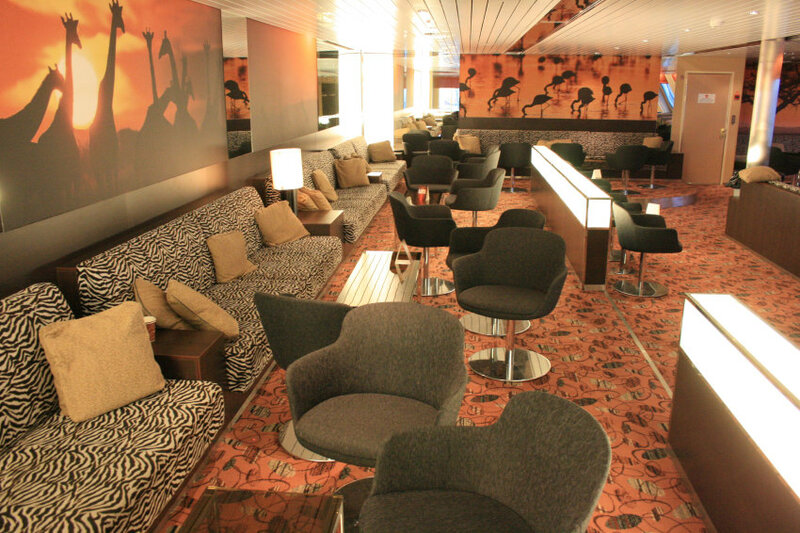 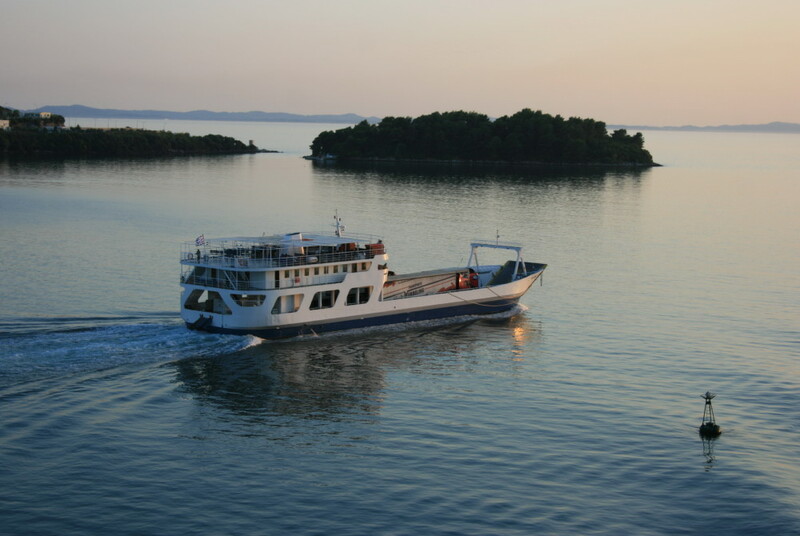 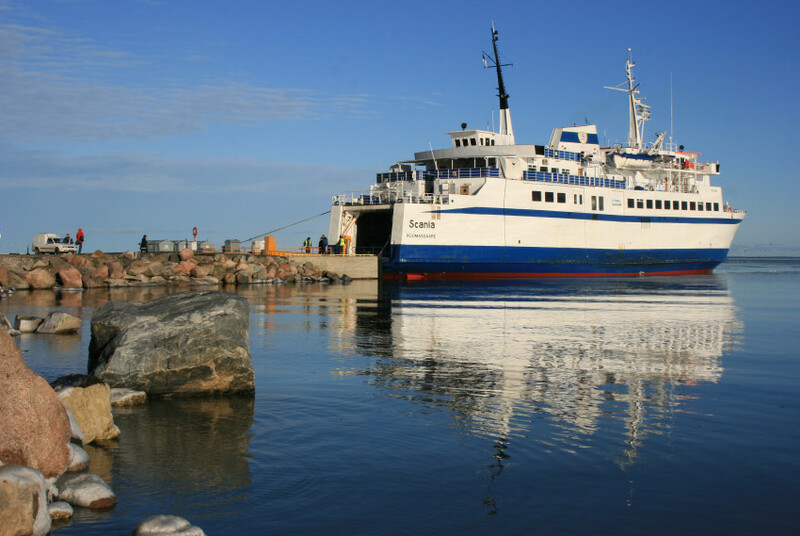 Major ferry ports in the UK and much of Northern Europe tend to be accessible only to travellers; gone are the days when ships formed an easily accessible part of everyday life for anyone who showed an interest. 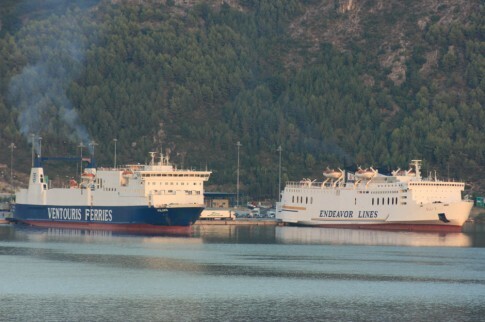 The ferry industry, driven by government regulation, has hidden itself away behind barbed wire and security fences. 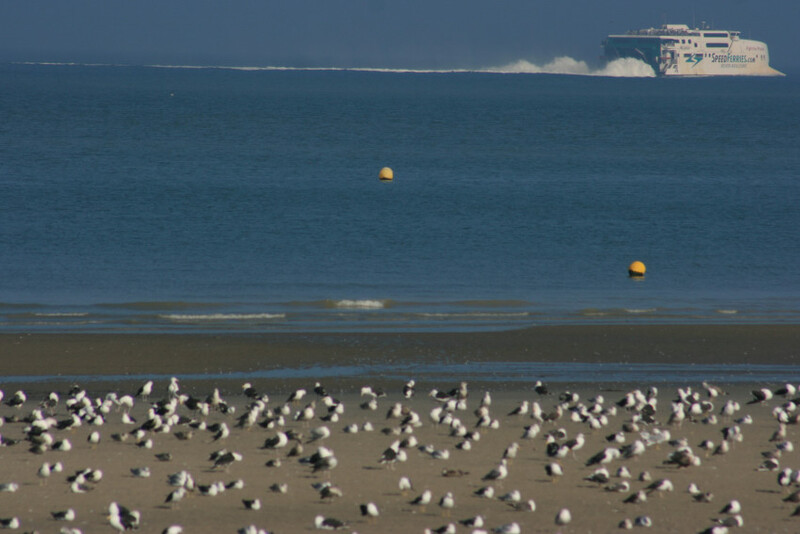 There is little for the casual observer to do but gaze from a distance at all the activity – but that certainly doesn’t provoke either a desire to join them behind the fence or take much of an interest in the goings on. 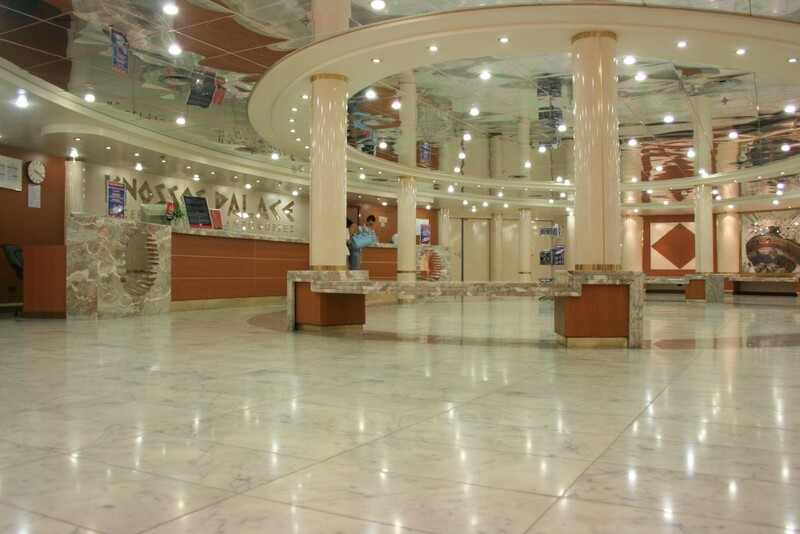 For many passengers, ferry travel forms the bookends to a leisure experience – why should they be intimidated from recording this, oppressed by obnoxious and overzealous security, unable to enjoy these out of the ordinary moments? 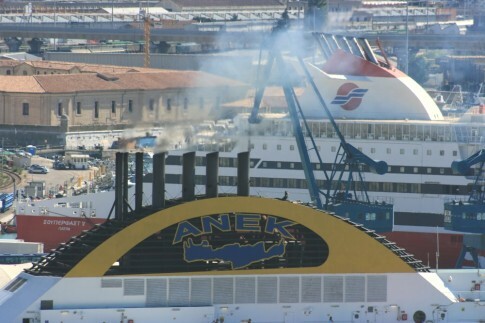 In Southern Europe, several of the major ports have followed the precedents of their northern counterparts; however there remain a great number of very substantial port complexes where free movement is permitted, photography allowed and where one can sit and safely watch the activity. Presented below are some recent pictures taken from the quayside of Igoumenitsa in Greece. 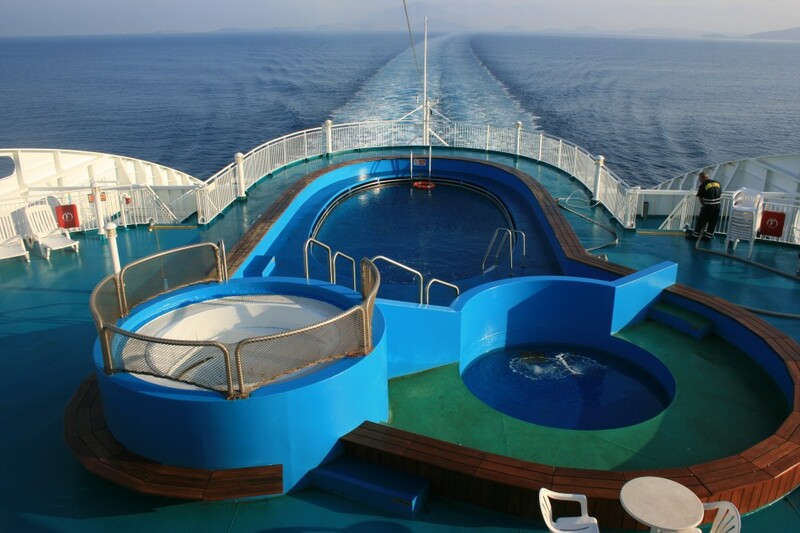 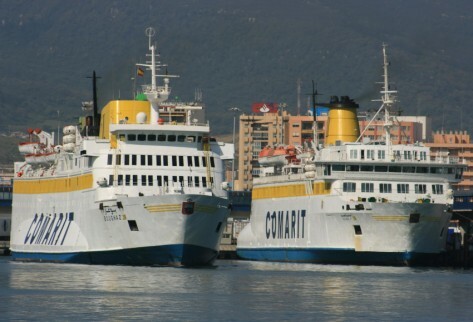 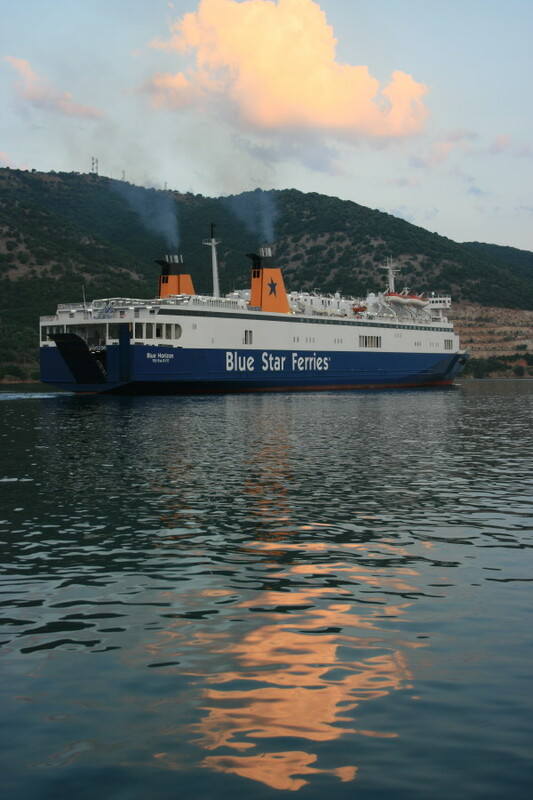 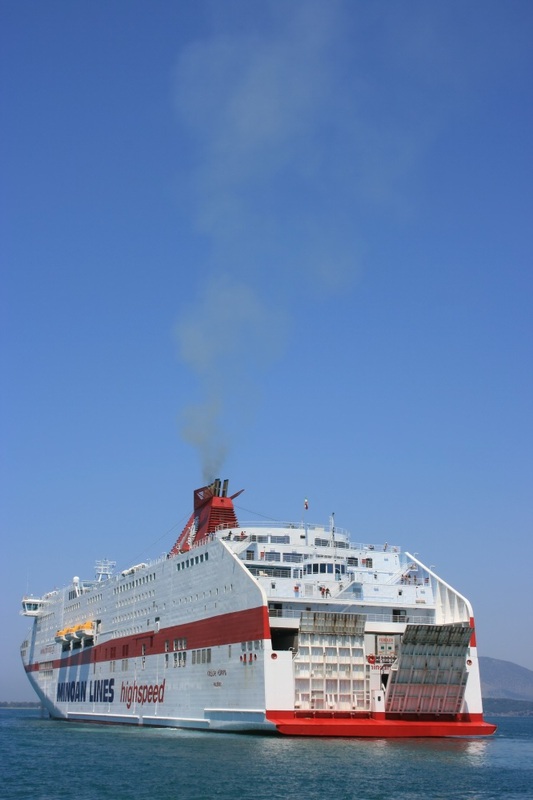 Crossroads of all Italy-Greece ferry sailings, Igoumenitsa ranks as one of Europe’s most exciting ports for the enthusiast, with the morning rush hour in particular being a rapid fire succession of major passenger shipping. 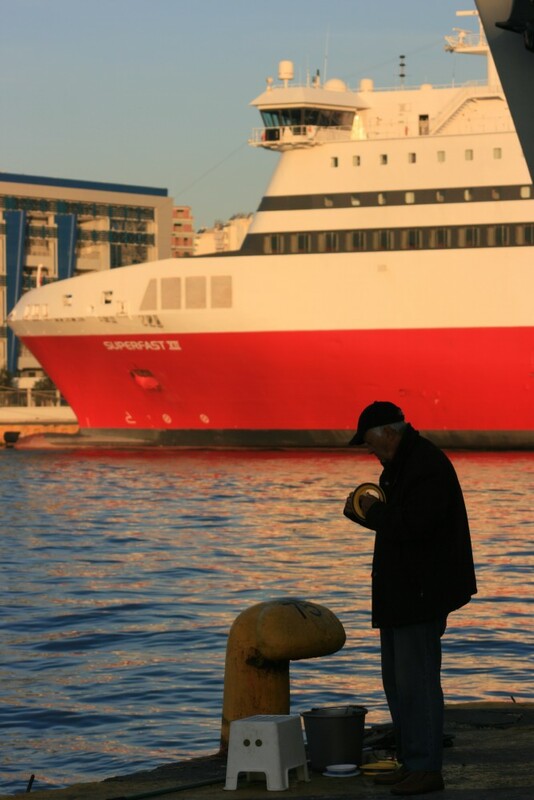 For me it comes second only to Piraeus for the sheer joy to be experienced simply by being in close proximity to the wonders of working ships. The early evening departures ex-Brindisi and Bari, heading for Patras, call at Igoumenitsa in the small hours of the morning. 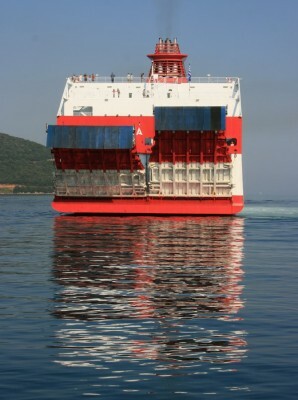 Seen here is the Ionian Queen of Endeavor. 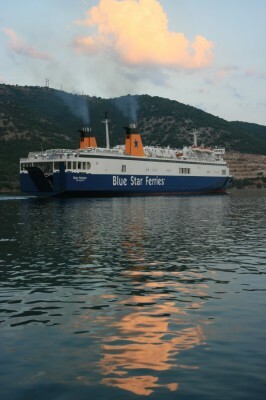 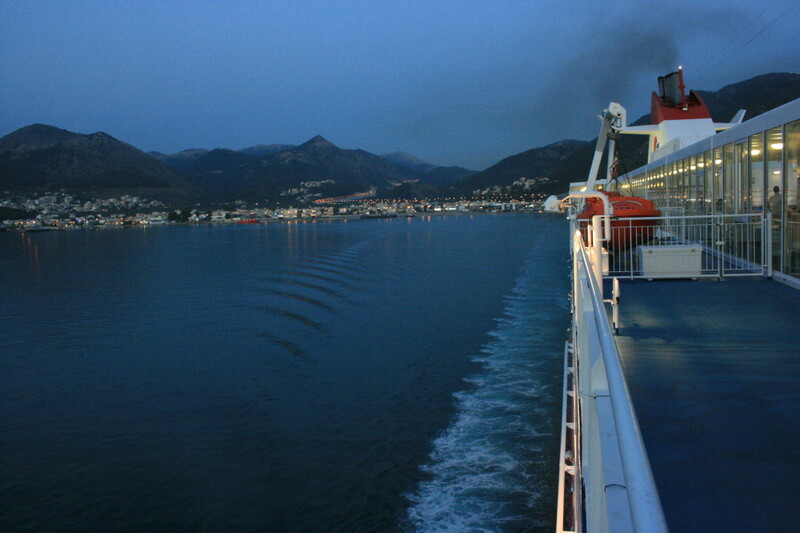 Igoumenitsa was traditionally a stopping-off point between Italy and the southern Greek port of Patras. 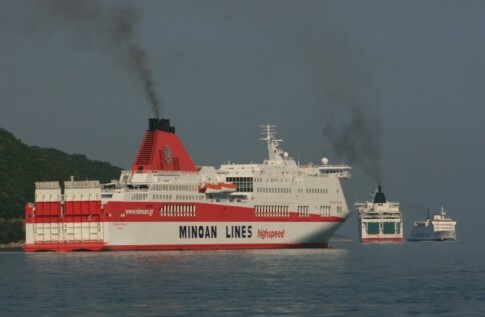 In more recent years for many ships the leg down to Patras has been abandoned and Igoumenitsa is the Greek terminus, being conveniently the starting point of the new Egnatia Highway. 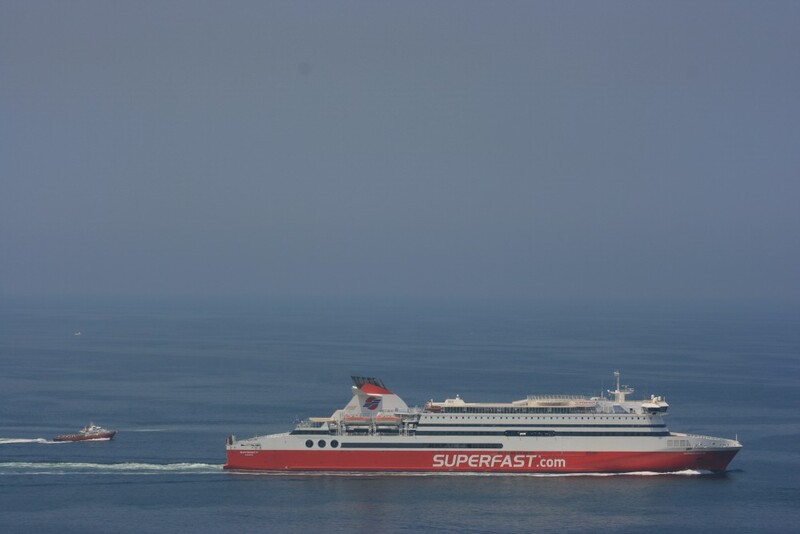 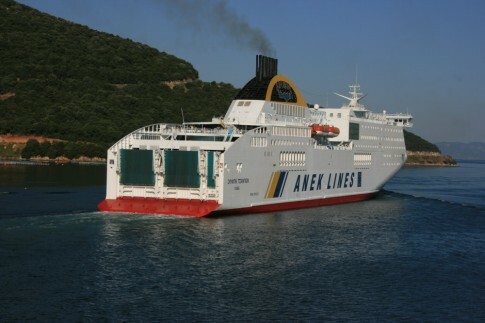 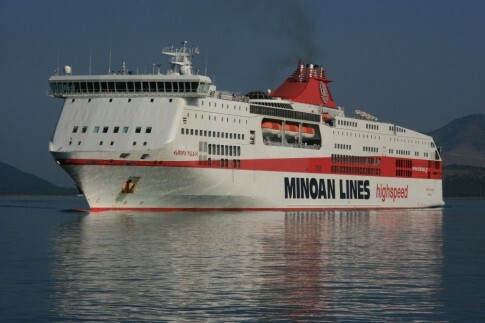 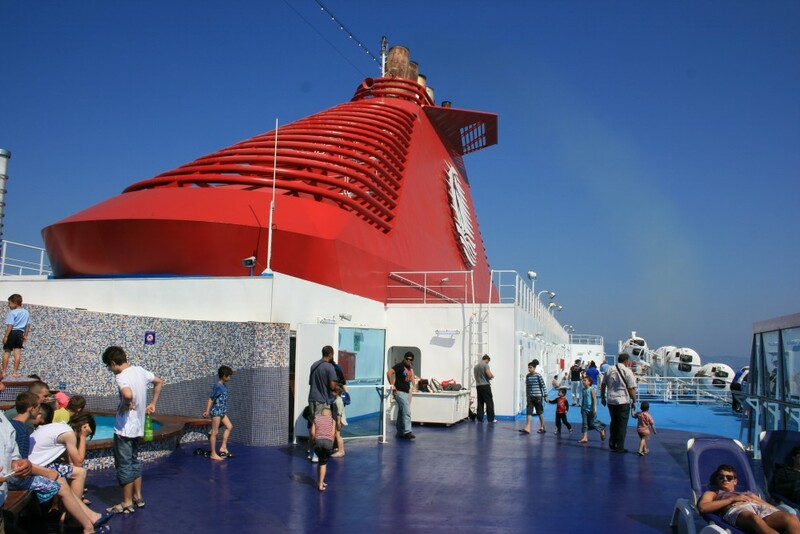 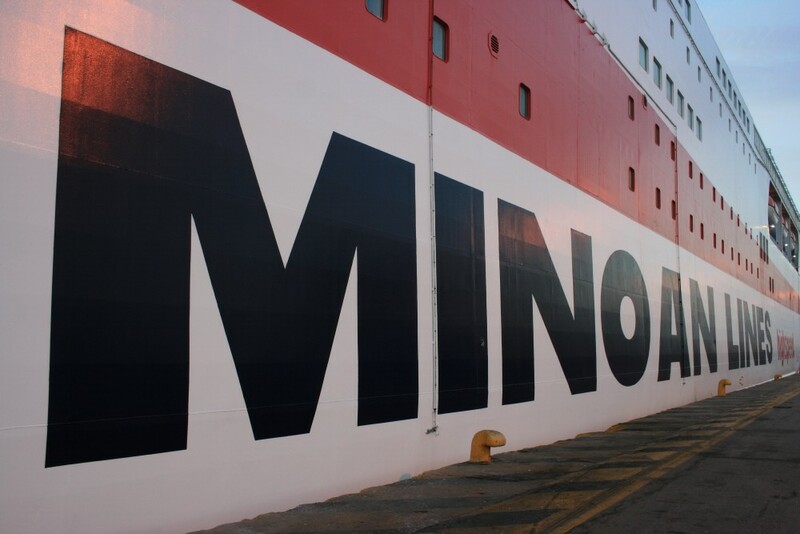 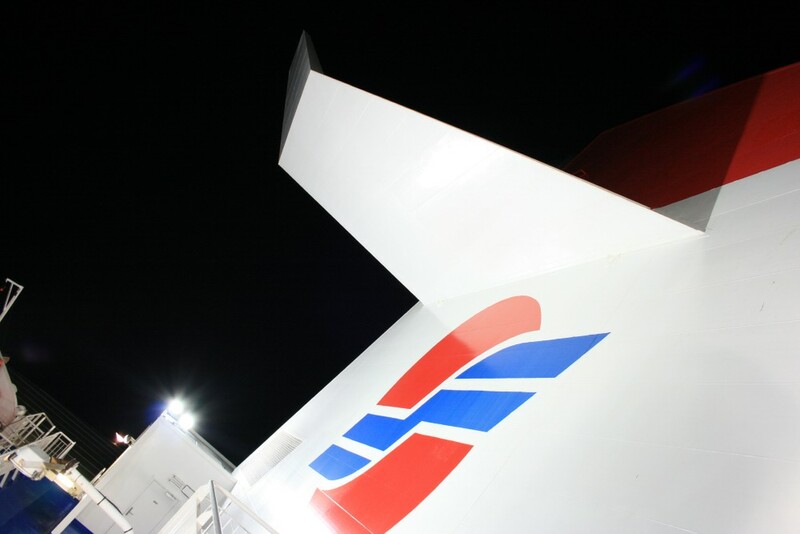 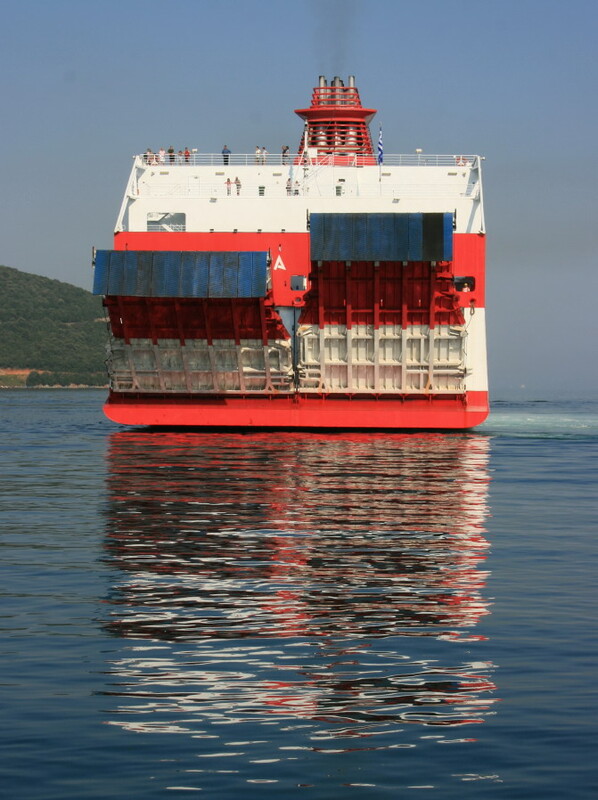 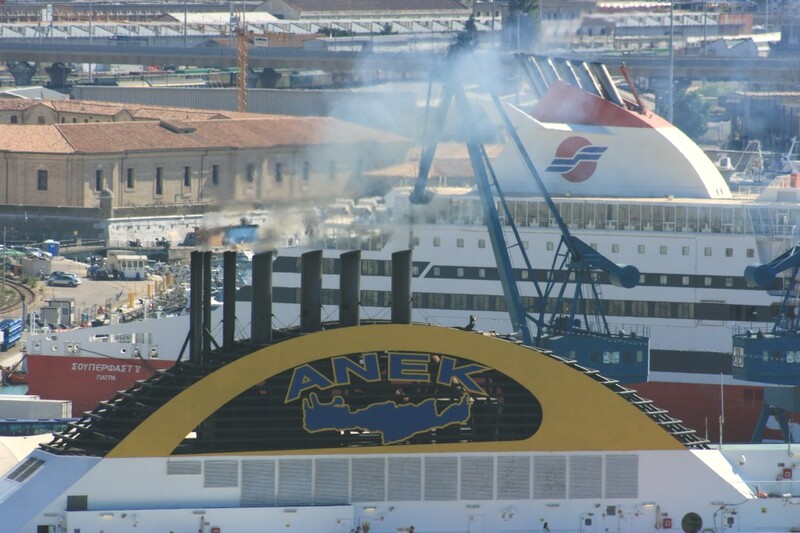 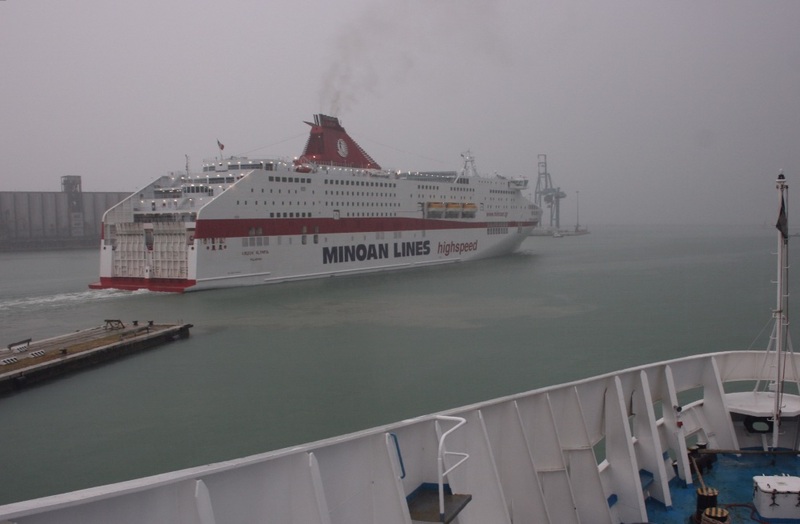 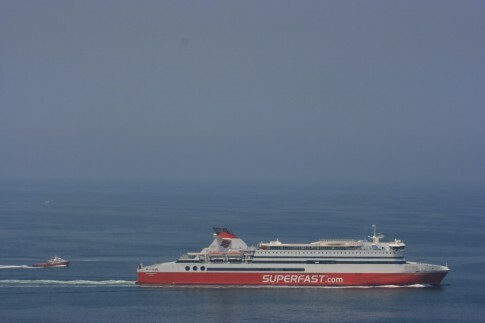 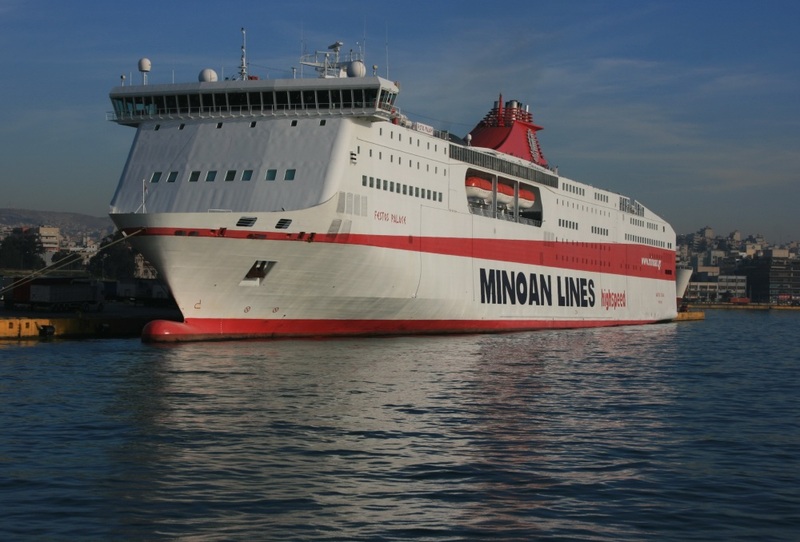 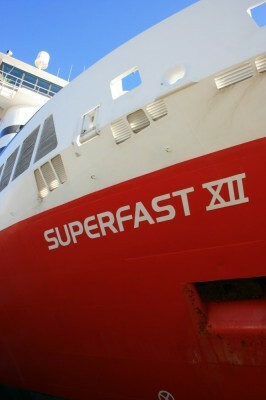 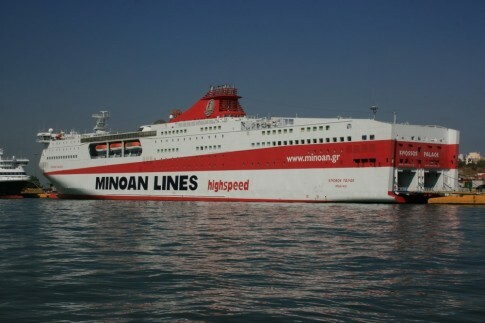 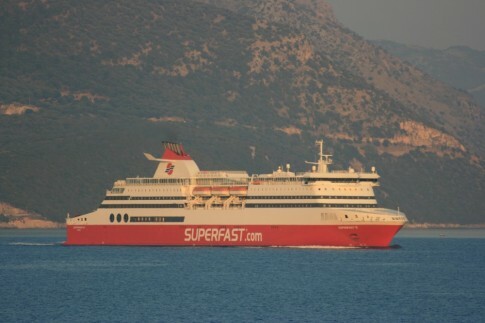 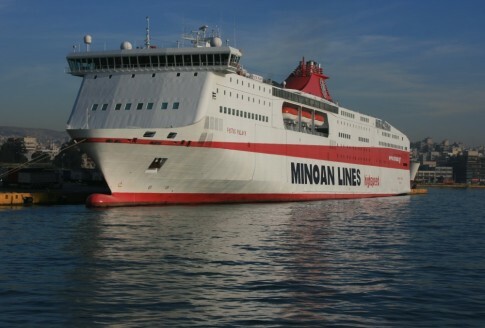 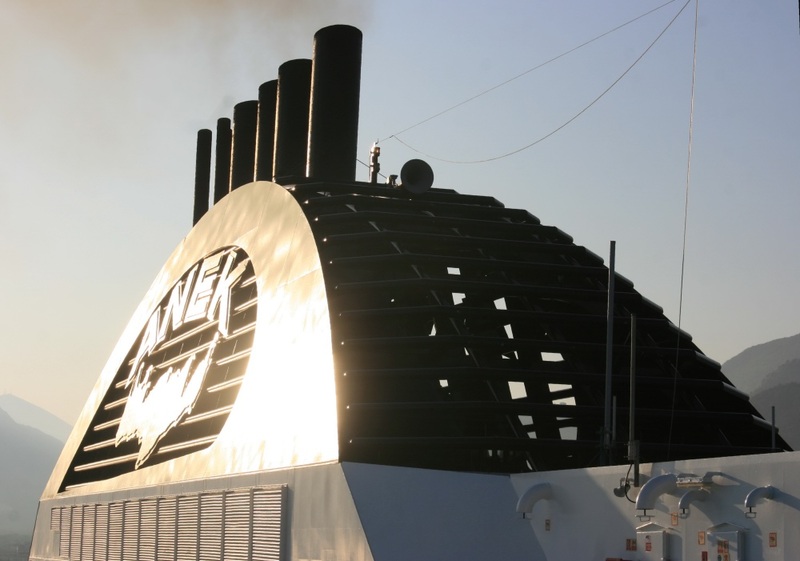 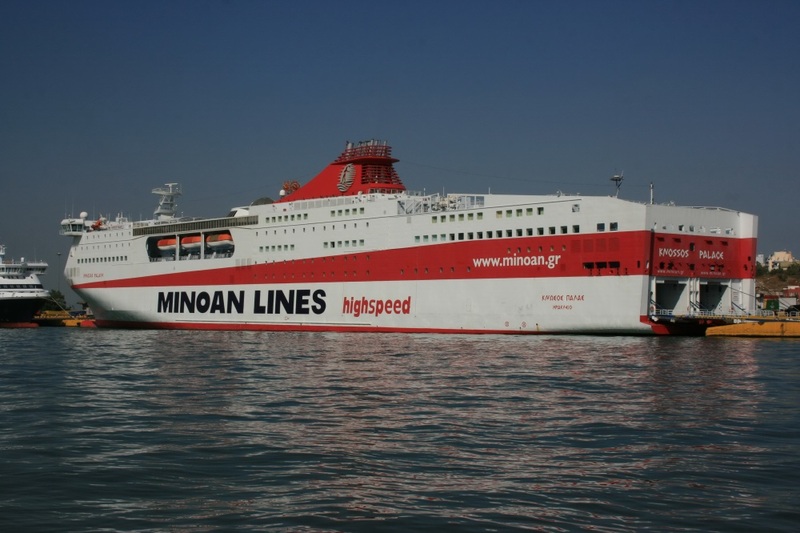 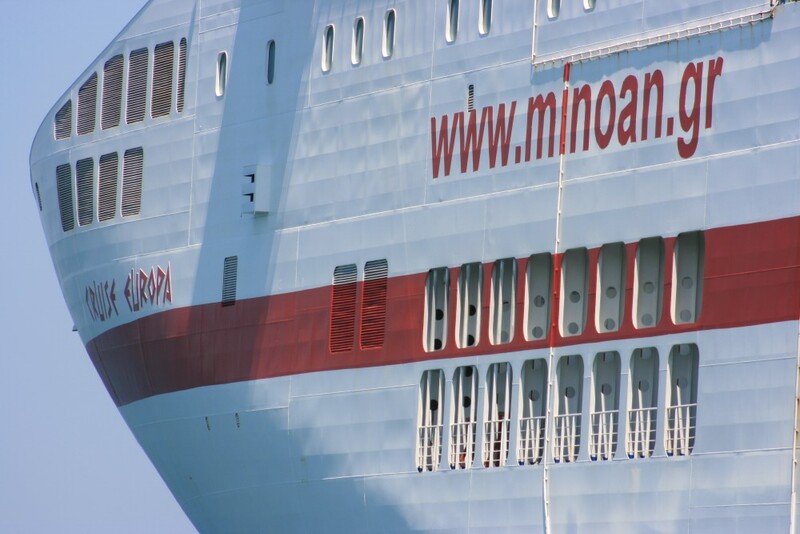 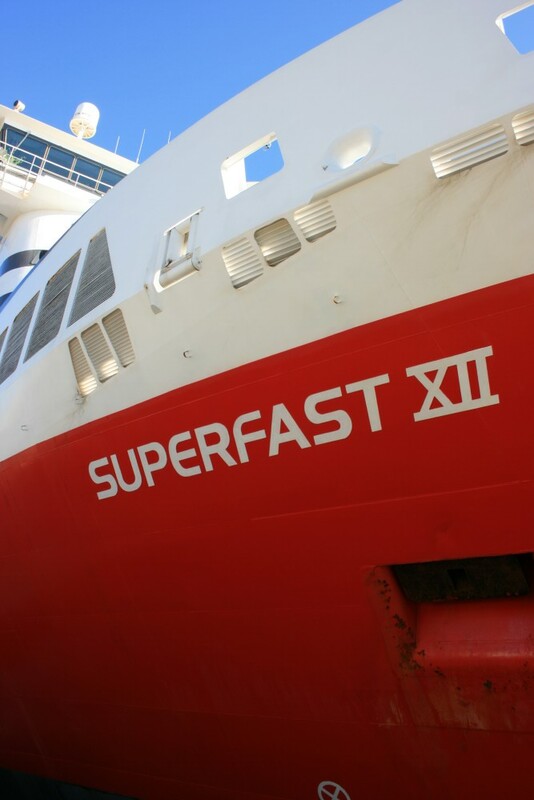 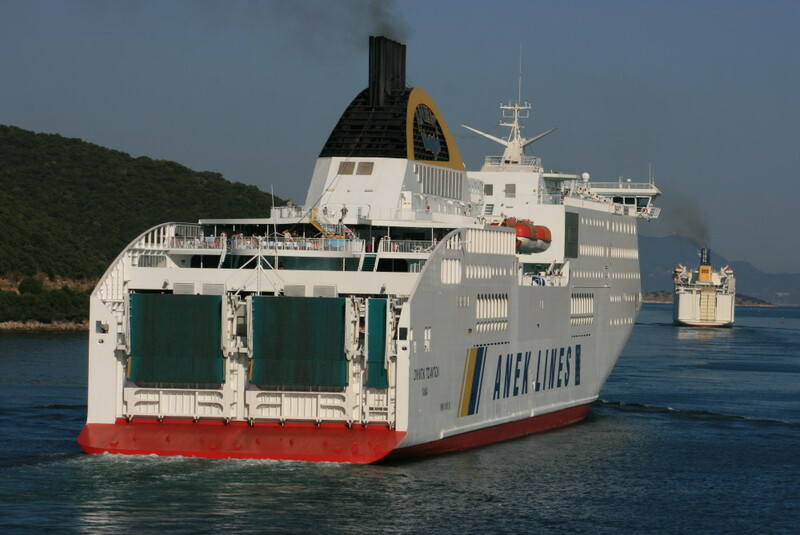 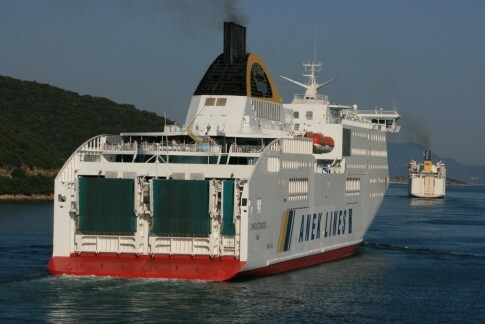 The big competition is on the routes from Ancona to Patras, where ANEK, Minoan and Superfast deploy big, impressive, fast purpose-built ships year-round. 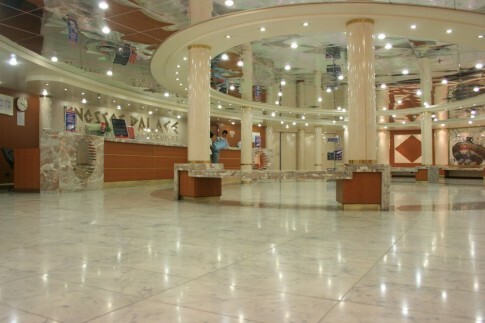 ANEK and Minoan also offer Venice services. 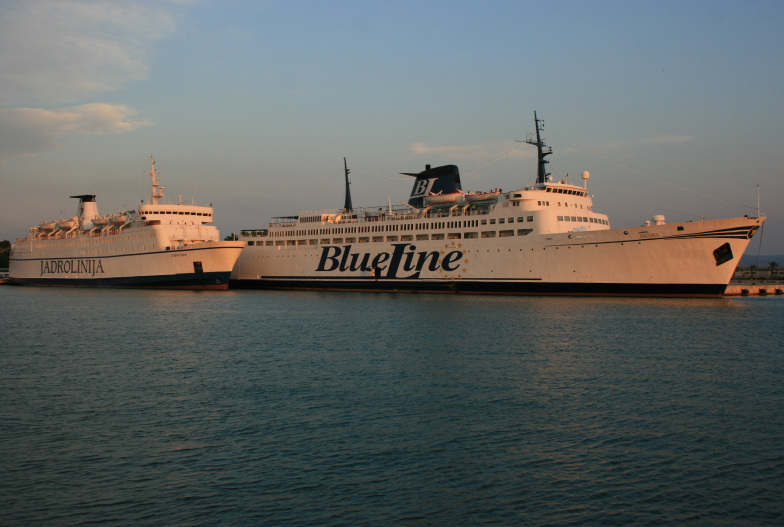 From Southern Italy, the historic departure point of Brindisi, shorn of its equally historic ‘legacy’ operators, HML and Adriatica, has seen some turbulent years with a variety of operators trying to make money on what had become a very marginal business. At Bari Agoudimos, Ventouris Ferries and Blue Star/Superfast each has its own rather different niche. 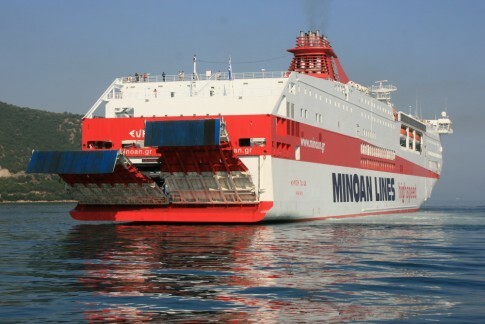 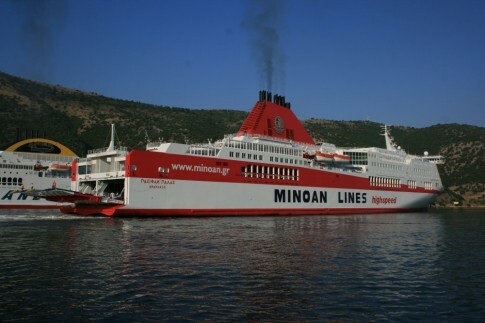 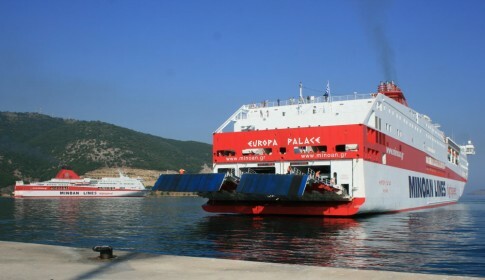 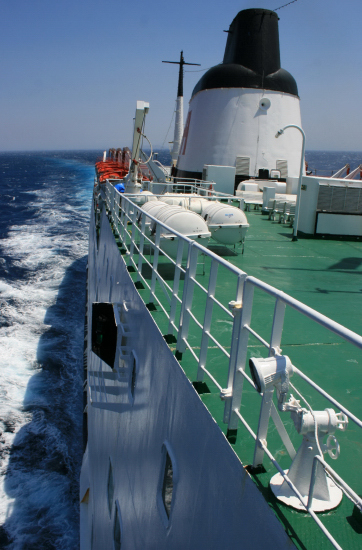 For ships calling at Igoumenitsa en-route to or from Patras, the calls can be sometimes quite chaotic, lasting as little as ten or fifteen minutes in which time cargo and passengers must be assembled, unloaded and loaded with military precision. 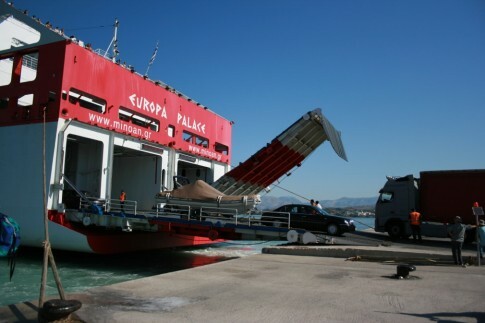 Minoan's Pasiphae Palace (Venice service). 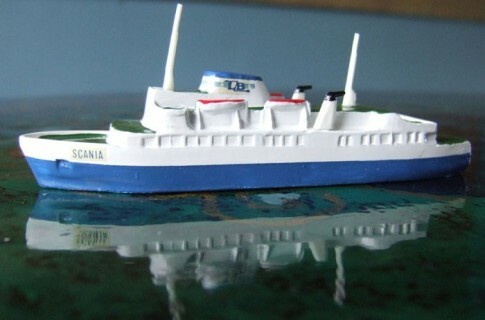 This ship has subsequently been sold to SNCM. 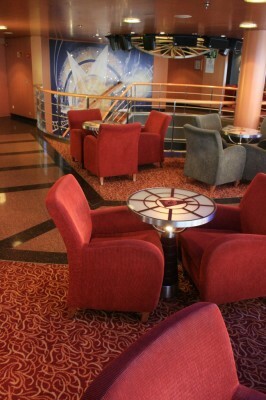 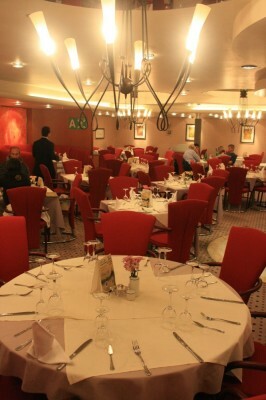 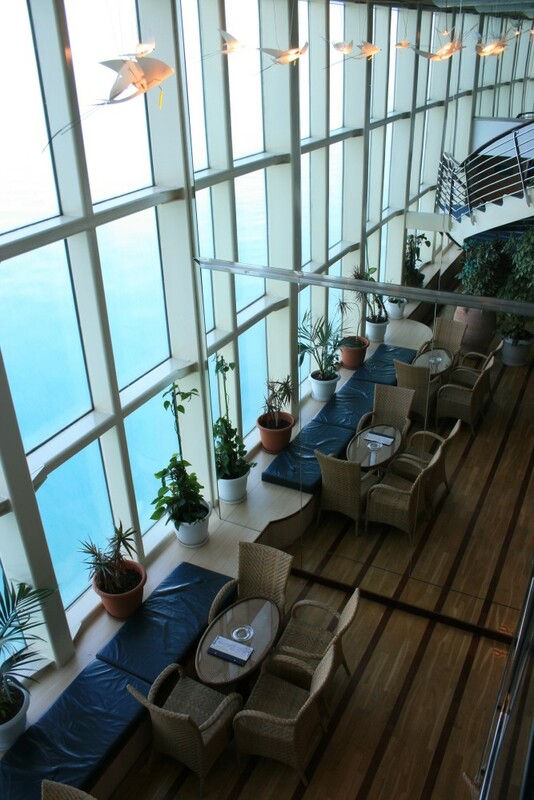 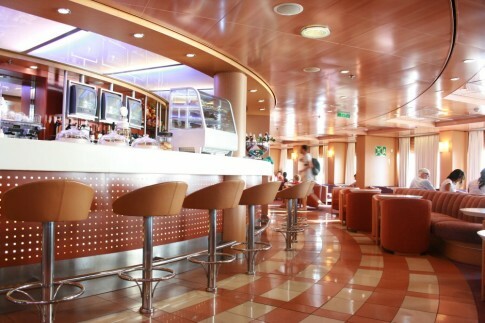 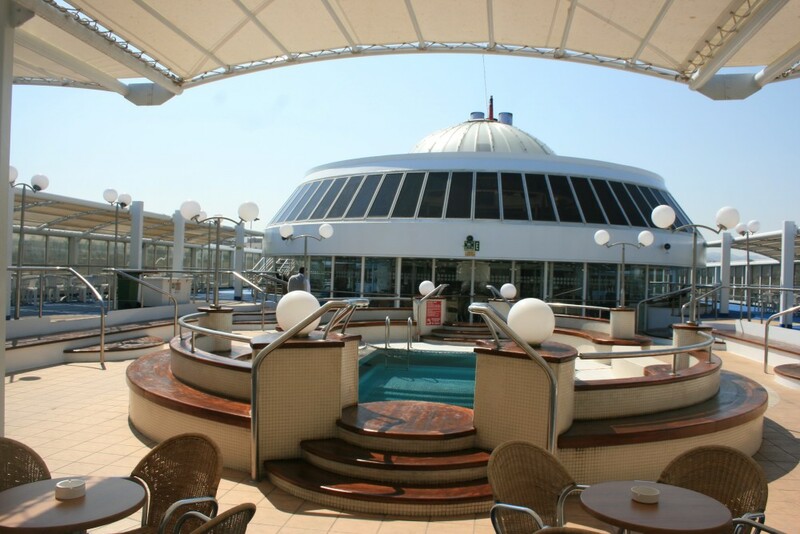 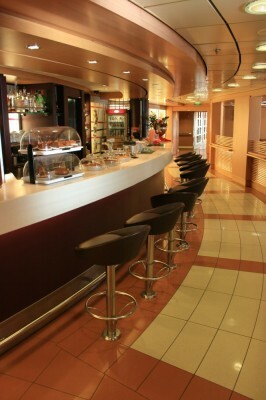 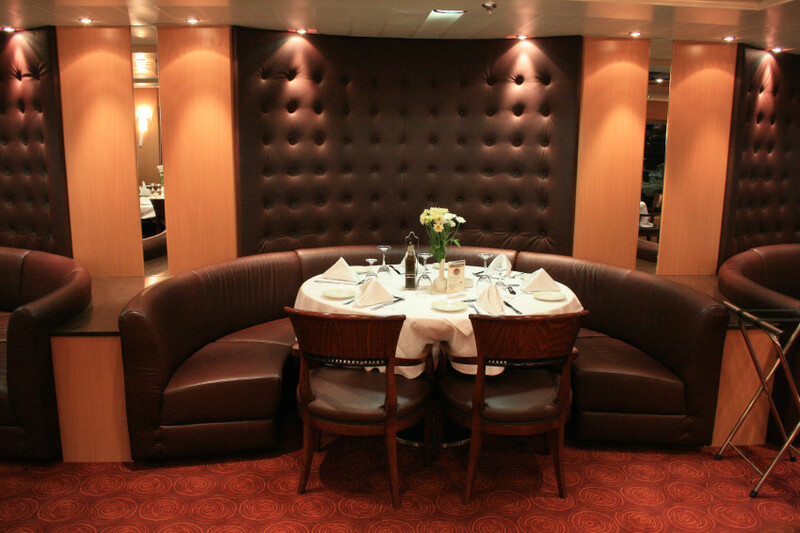 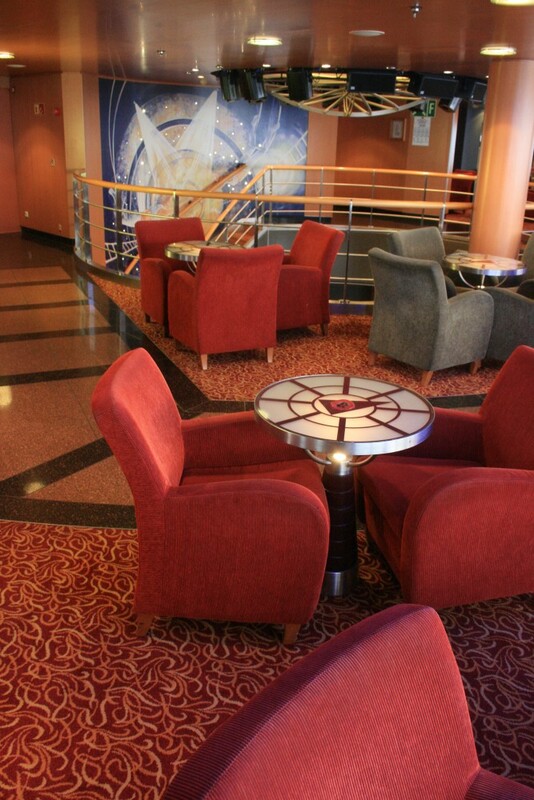 The Apollon (ex-Senlac) of European Seaways' Brindisi service. 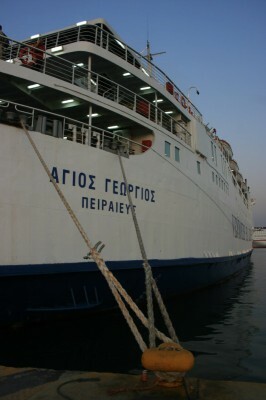 This operation has been discontinued for 2009. Igoumenitsa's morning rush. 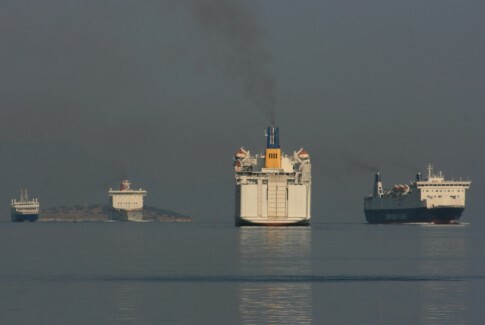 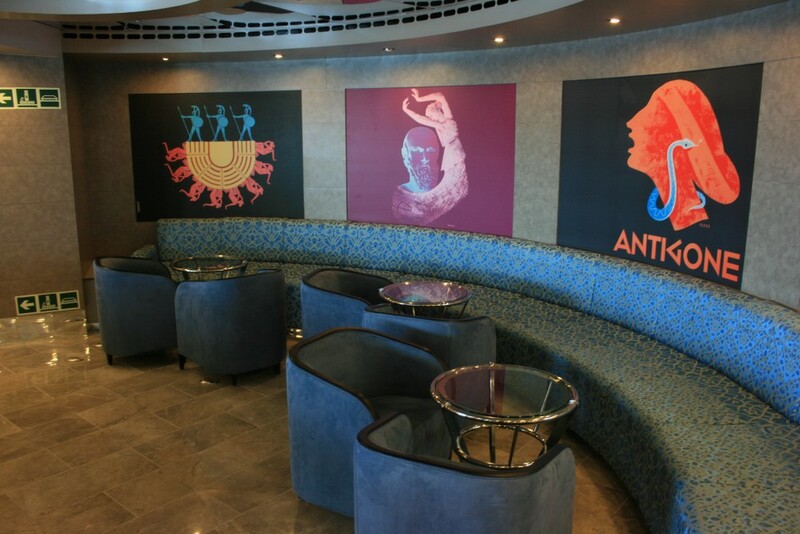 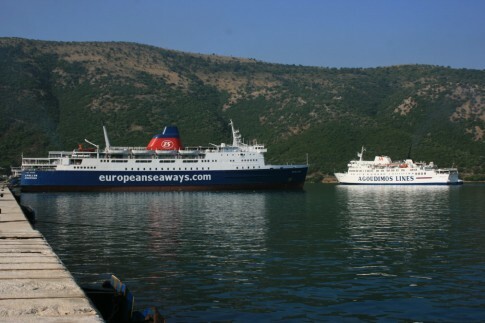 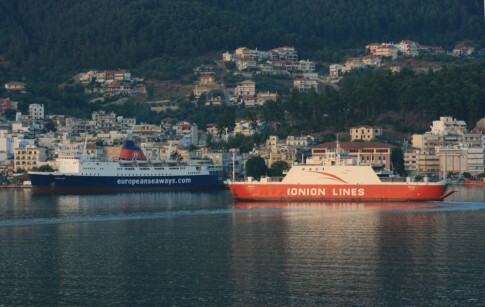 l-r: the Corfu ferry Achaios, Minoan's Ancona ship Europa Palace, ANEK's Lefka Ori and Ventouris Ferries' Siren. 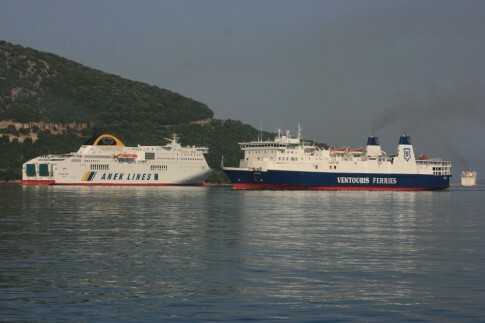 l-r: Hellenic Spirit, Siren and Lefka Ori. Minoan's Pasiphae Palace (Venice service) and Europa Palace (Ancona service). 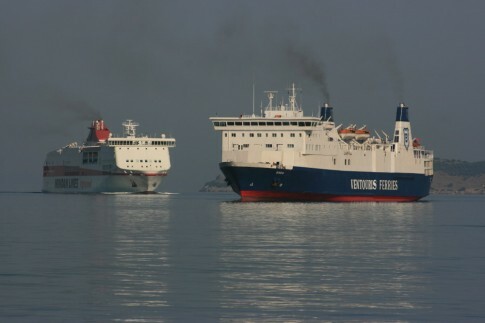 Pasiphae Palace, Hellenic Spirit and Agoudimos' Brindisi ship, the Ionian Spirit (ex-Roslagen/Viking 3). 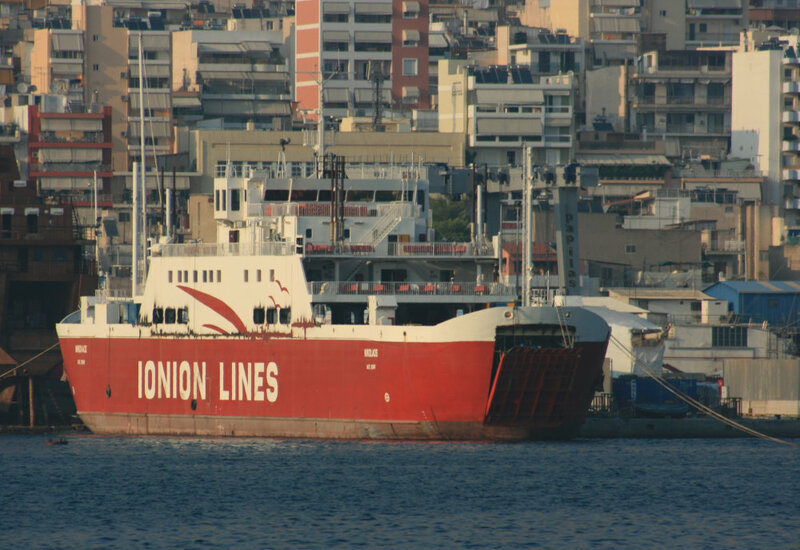 The local ferries to Corfu depart from the old port - here is Ionion Lines' Nikolaos, ex-Superflex Alfa, the very first of her class. 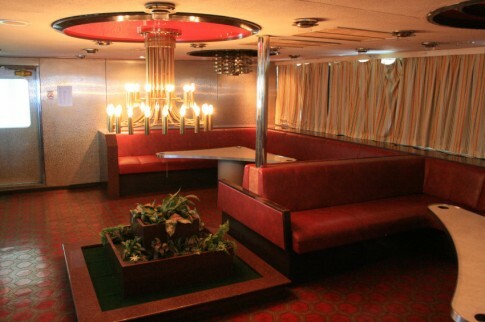 She spent several years laid up before entering service in her current trade. 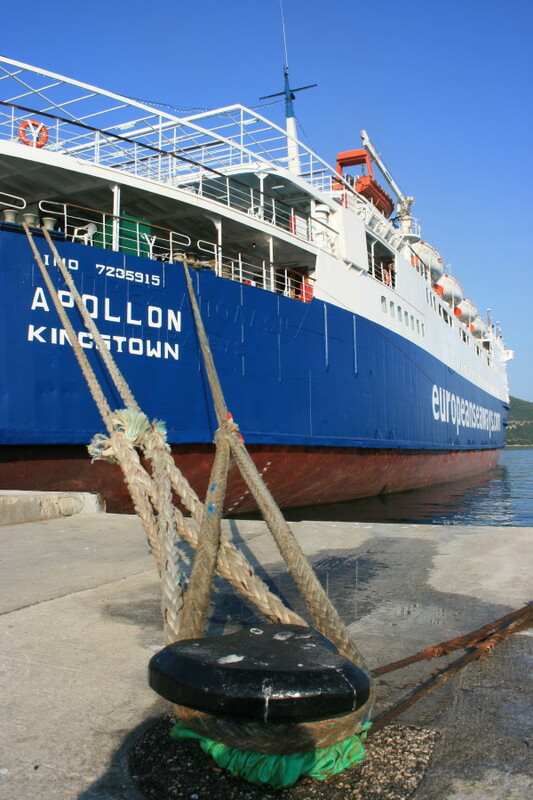 The Apollon is also seen at lay by during her hesitant start to the 2008 Summer season. 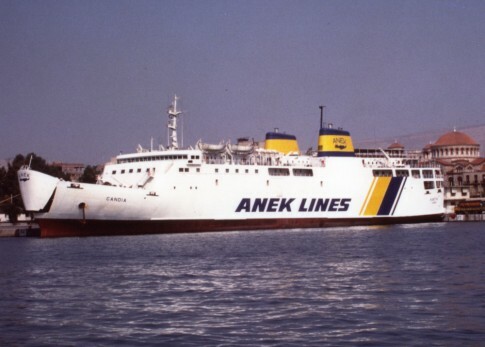 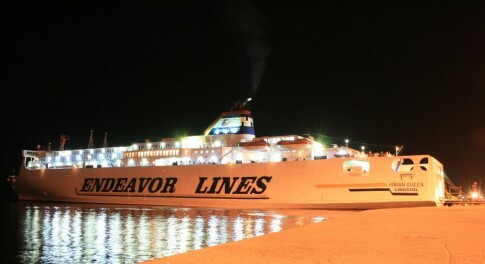 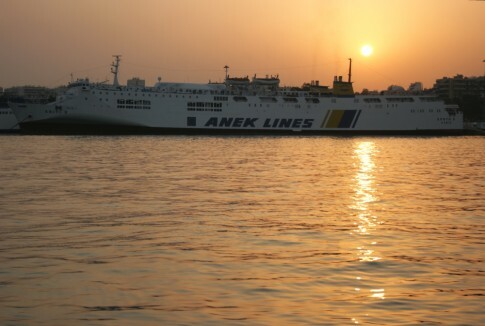 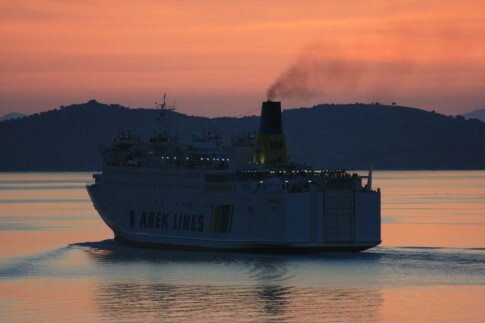 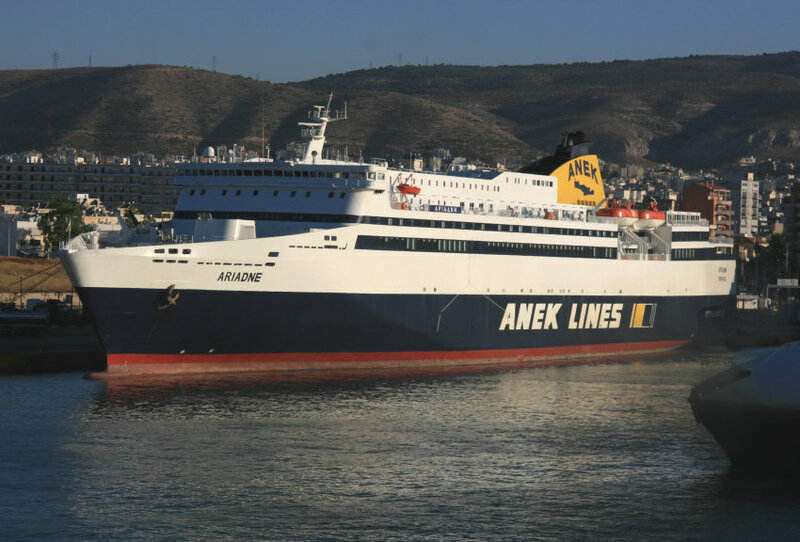 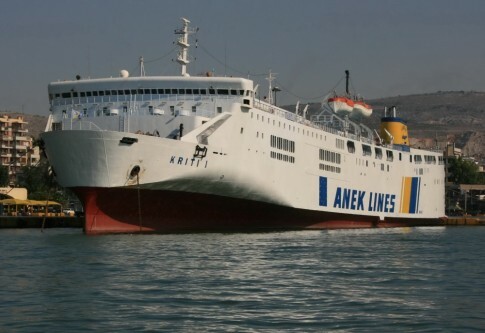 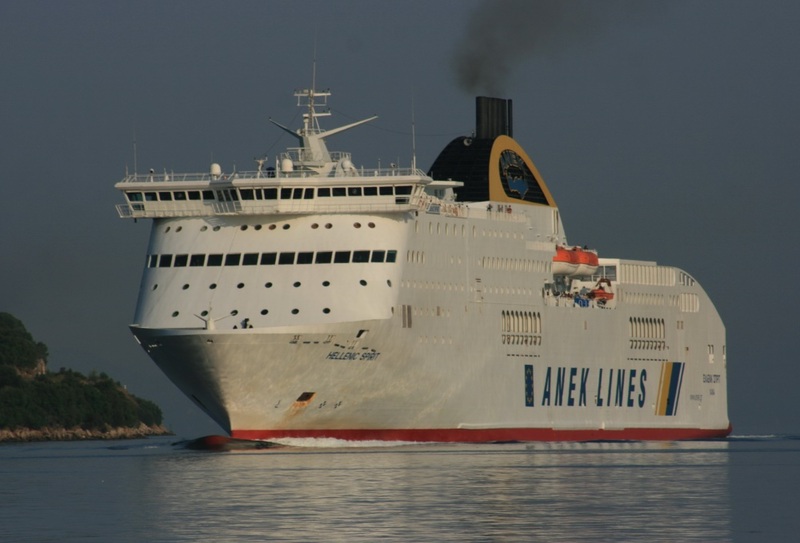 ANEK's Sophocles Venizelos departs for Patras. Leaving Igoumenitsa on the Superfast VI headed for Ancona. 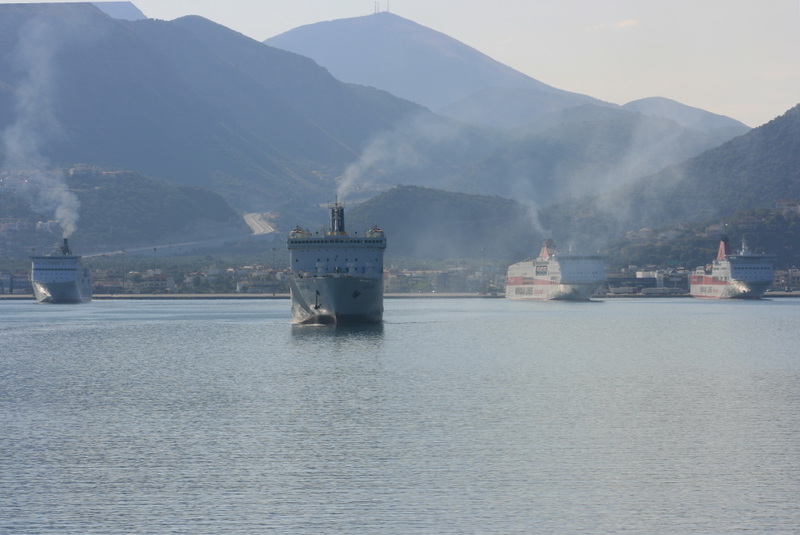 Outbound from Igoumenitsa, with a landing craft type ferry headed for Corfu.